Clare Furniss | How Not to Disappear cover reveal! How Not to Disappear cover reveal! 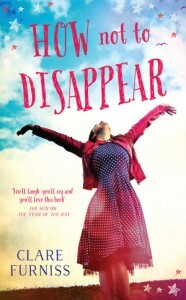 The gorgeous cover for my next book, How Not to Disappear, has been revealed! This is a REALLY exciting moment for an author – the moment when the story you’ve been slaving over for months and at times felt you’d never finish actually starts to feel like a real book. I absolutely love this cover, I think it really captures the spirit of the story and the two main characters, Hattie and Gloria. I’ll be posting more about How Not to Disappear and the trials and tribulations of writing a second novel later this week… For now I’ll just say it’s been hard work (bit of an understatement) but I’m pretty proud of the result! The book will be out on 28th January 2016.